Story Update, Oct. 25, 2017: See the Port-A-Bridge in action in ComEd’s new video. On June 29, a heavy rainstorm blew through the Algonquin and Lake in the Hills communities making a creek on either side of Dennis Road rise dangerously. The fast-moving current made the road unstable and eroded the soil around a ComEd electrical pole, threatening its fall and potential power outages. The ComEd crew dispatched to relocate the pole to a more stable area was unable to reach the pole using the road. Fortunately, they had a backup plan: a portable bridge, called a Port-A-Bridge, which they quickly deployed over the roadway to reach the pole. The Algonquin-Lake in the Hills Fire Protection District requested that the Port-A-Bridge remain in place until repairs could be made to the existing culvert and roadway. More than 30 homes are located south of the creek in un-incorporated Lake in the Hills, and Dennis Road is the only access to the community. The Port-A-Bridge over Dennis Road in Algonquin..
Also grateful for the help is the Algonquin Township Highway Department. 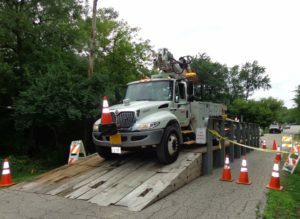 “ComEd has been a very gracious partner with the Dennis Avenue washout,” says Algonquin Township Highway Commissioner Andrew Gasser. The department is leasing the bridge as the road is repaired. “The bridge was the only thing that would solve our problem in this situation,” says Michael Mann, a new business manager for ComEd whose team helped design and create the Port-A-Bridge. Ironically, a storm was the catalyst for the creation of the Port-A-Bridge. Following a storm in Joliet in February 2015 that resulted in numerous power outages and damaged equipment, a ComEd crew assigned to restore power came upon three broken electrical poles. Eager to get to work, their hearts sank as they realized that they could not reach the poles in their truck due to train tracks on one side and a creek on the other. With hopes of a quick fix dissolving in the nighttime air, they knew they needed help. So they halted their restoration efforts to review their options to gain access. One option would be to contact a vendor to rent and wait for the delivery and deployment of matting that would serve as a temporary bridge to reach the poles. Port-A-Bridge deployment in Bloomington, Ill. In recent years, ComEd has been in the business of making better ways. The company is in the midst of an innovation transformation, encouraging employees to think big and think fresh when it comes to designing solutions and creating great customer experiences. Michael and his fellow ComEd employees have taken this call to innovation to heart. Faced with situations like the storm in Joliet, they brainstormed with their team in Joliet. In September 2015, Michael, then a construction and maintenance manager, and Jose Mitra, a developmental supply manager, turned to one of ComEd’s innovation tools, the Innovation Hub, to submit their idea for an easy-to-install, portable, temporary bridge to ComEd executives. “We knew that the bridge we wanted would improve productivity, save money, improve customer satisfaction, and reduce the environmental impacts of ComEd’s trucks in environmentally-sensitive areas,” Michael says. ComEd executives approved the idea and provided funding for ComEd to work with Griswold Machine & Engineering to develop the Port-A-Bridge. The modular, 12-foot-wide bridge is designed for rapid delivery and installation to enable vehicles, equipment, or personnel to proceed over previously impassible areas. The first Port-A-Bridge arrived at ComEd in December 2016 – and Michael says he was in awe to see the idea come to life. ComEd now has two bridges – one 30-feet-long and the other 40-feet-long. ComEd honored the Port-A-Bridge with an innovation award in February 2017. 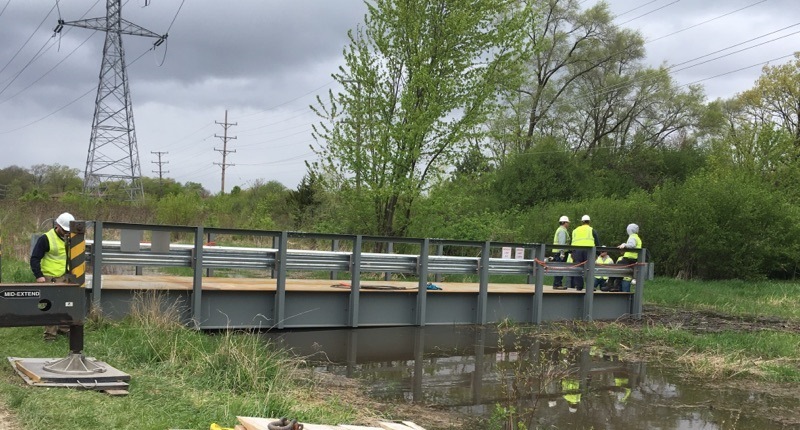 “These bridges can be installed on site in minutes, making it ideal for our crews to restore power to our customers quickly and efficiently,” says Michael, whose team also worked to develop the bridge with Terry Shanklin, Senior Project Construction Manager, ComEd.